Access to the web console is user ID and SSL password secure. The Remote Server Management over IP card supports 32 user accounts and incorporates SSL encryption of session data, and SSL web communication encryption. Hot-pluggable to allow computers to be added or removed without worrying about having to reboot the other connected systems. 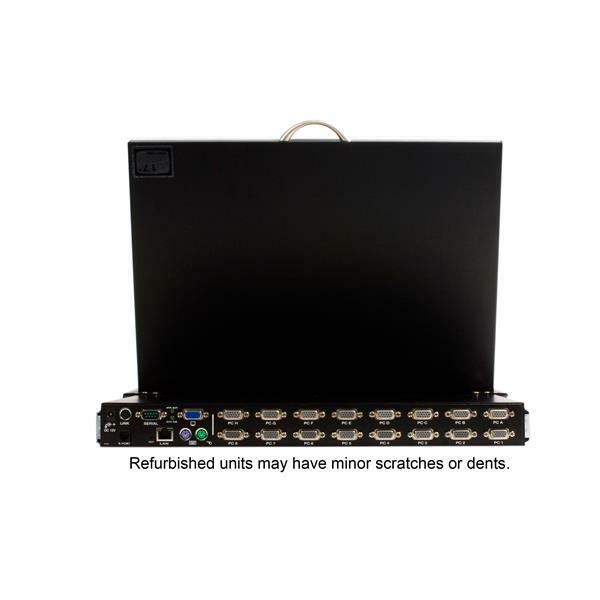 This Refurbished 1U Rack Mount LCD KVM Console features an integrated 16 Port Multi-Platform IP KVM Switch module, 17in active matrix LCD monitor, 105-key keyboard and mouse touchpad neatly combined into 1U of space in any standard rack or cabinet 30in (or greater) in depth. 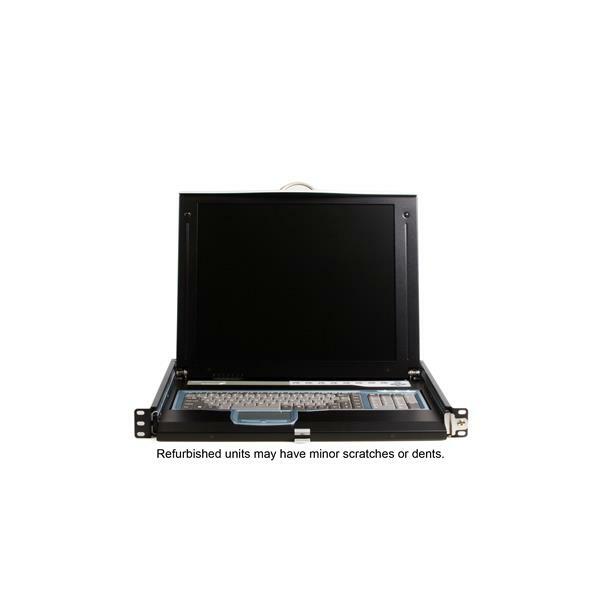 The IP KVM console offers a design similar to that of a rackmounted laptop computer - when the console is not in use, it's as simple as folding the LCD display and keyboard/mouse up and sliding it back into the server rack on the sturdy mounting rails (included). A highly-scalable server control solution, the integrated 16-port IP-based KVM switch allows 16 computers (up to 136 computers through eight cascaded 16-port KVMs) to be directly controlled from the console or via the LAN, WAN or Internet, with system navigation options including front panel pushbuttons, hotkey commands and a convenient on-screen display. To ensure a comprehensive server remote control solution, the LCD KVM Console offers BIOS level control and full interaction with your system’s boot process, providing exceptional remote monitoring capability and control of every aspect of the connected computers. 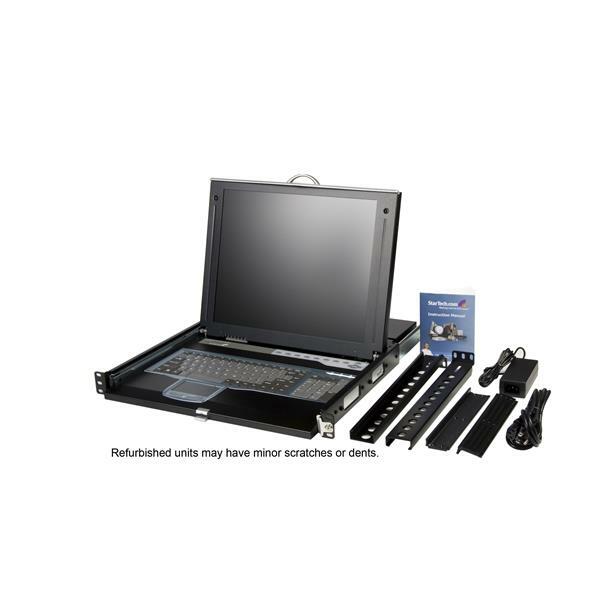 The IP KVM Console also provides a secure and convenient operating experience, allowing each of the connected computers to be given unique names and locked to prevent unauthorized access. 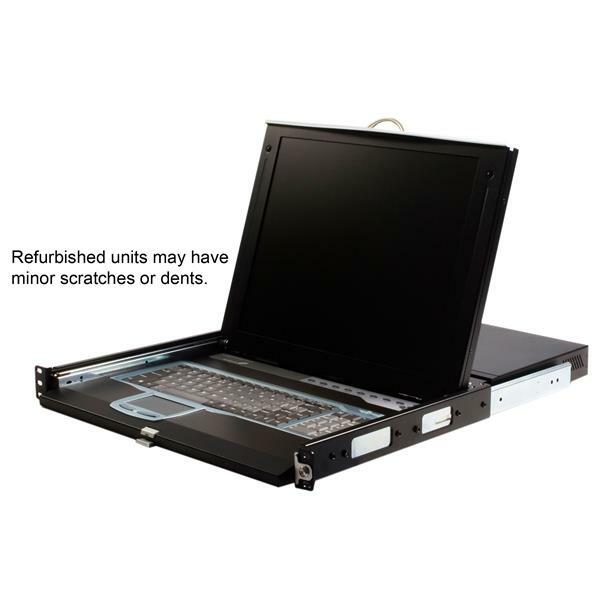 Providing further versatility, the console is designed for guaranteed compatibility with Dell, Compaq, IBM and HP servers and systems and includes all required rack mounting hardware. All refurbished CABCONS LCD Consoles have been individually tested by StarTech.com technicians and are guaranteed to be fully functional. Units include complete mounting hardware and accessories as intended with the original (non-refurbished) product, and are provided in the original packaging. Refurbished units may have small scratches in the black paint on the metal casing, but all other components are as new. Every refurbished CABCONS LCD Console is backed by a 90-day replacement warranty, plus free lifetime technical support. Security: SSH tunneling, SSL encryption, RADIUS authentication, and a configurable firewall are all included to ensure that your network stays secure. Remote Power: Use StarTech.com’s 8 outlet Remote Power Module (PCM815SHNA) to power computers and equipment on an off using an interactive menu. Serial Control: Use the Serial Remote Interface Module (RPORT) to interact with virtually any device that uses a RS-232 serial terminal interface like routers, switches, environmental controls, alarm systems, and more. Adding more than 1 optional PCM815SHNA power switch to the Server Remote Control requires a RPORT module. Source code for the unit operating system is available upon request. Please contact us by phone, live chat, or email to make your request. This offer is valid for three years from the date of purchase and/or for as long as parts or customer support is offered for this product. Charges for the reasonable cost of copying and/or conveying may apply.